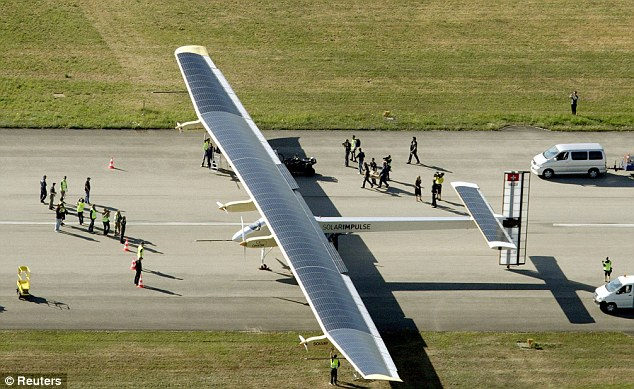 This is the same Swiss solar-powered plane that made a daring voyage from Europe to Africa last year. The aircraft takes off on 24 May 012 in Payerne and travel through Madrid , destined for Rabat in Morocco. Powered by 11,628 solar cells on its back and with a wingspan of about equivalent to a Boeing 747, a solar-powered plane that has wowed people in Europe is now preparing to fly across the United States. The Solar Impulse plane will take off on May 1, weather permitting, and will make stops in Phoenix, Dallas and Washington before arriving in New York in early July. Reuters photo. (California-AFP) - The experimental Solar Impulse plane, which has made several trips since its maiden flight in 2009, will take off on May 1 on a transcontinental tour split in five stages. "The people will be able to follow the mission, to speak to the pilot, to ask questions. We would like to inspire students, schoolchildren, inspire as many people as possible to try to have the spirit to dare, to innovate, to invent." Piccard said. Borschberg and Piccard are planning an around-the-world flight of the plane in 2015. - Copyright (AFP RELAXNEWS), 2013. TheGreenMechanics: If this solar-powered plane make a trip to Malaysia, I would definitely set aside some time off and make the tour to see it for myself. For the rest of us who don’t live in the United States, we can still 'watch' the feat as it will be filmed and streamed LIVE on Solar Impulse's website with important news posted on Facebook. A showcase worth having a look.